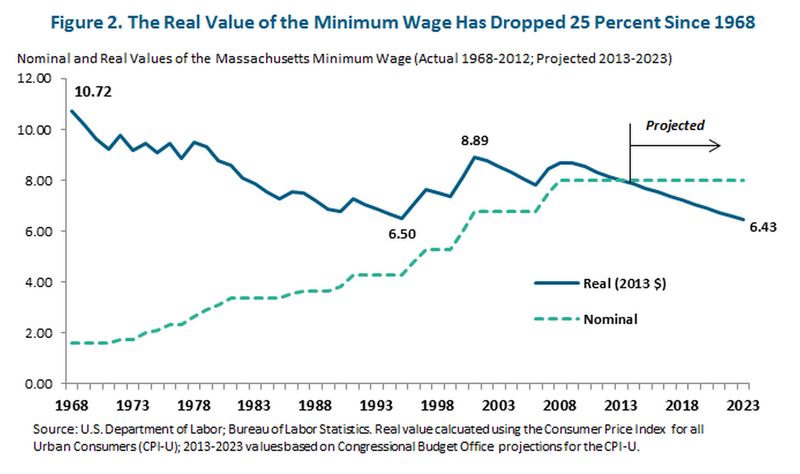 The chart above from the watchdog group MassBudget shows the minimum wage in real terms from 1968 to 2013. Real terms means what the minimum wage in these various years would buy in today’s dollars. From the chart it’s easy to see that the 1968 minimum wage in Massachusetts would be worth $10.72 in 2013 when the minimum wage is $8.00. What this means is that individuals working for minimum wage have gotten a wage cut of $2.72 since 1968; that’s a decrease of 25%. Or put another way, an individual could work 39 hours in 1968 at minimum wage and make $321.60. To make the same amount of money at minimum wage in 2014 that person would have to work over 40 hours. Since over 80% of our STCC students work, many if not most at minimum wage, the number of hours they must work to support themselves and dependents has correspondingly increased. This means more time working and less time for their studies. Is it any wonder so many of our student struggle to complete their associate degree? I was recently attended a meeting of the Massachusetts Board of Higher Education at Worcester State University (WSU), part of the Massachusetts State University system. Barry Maloney the President of WSU spoke first detailing the accomplishments of his University and lauding that fact that “79% of Worcester State faculty are full-time.” This is an achievement but one that is out of reach of the less well funded Massachusetts community colleges where, according to a study by the Massachusetts Teachers Association (MTA), just 28% of the course sections are taught by full-time faculty. This made me think of one of the few movies that feature a community college faculty member – Robin Williams playing Dr. Sean Maguire who teaches psychology at Bunker Hill Community College in Boston. Maguire challenges and helps the movie’s protagonist, Will Hunting, played by Matt Damon. Are there real Sean Maguires teaching at community colleges? Yes, for I have met many of them - energetic, resourceful and dedicated to helping their students learn and succeed. But there are not enough of them as evidenced by the statistics above. Teaching, especially at a community college, should not be a part-time job.